Coventry has one of the best collections of medieval art and architecture in the country, as well as examples of its tradition of high quality 15th-century music and drama. This reflects Coventry’s late medieval ‘golden period’ between c. 1350 and c. 1540. During this period, Coventry had a flourishing and highly acclaimed artistic community of painters, glaziers, musicians and performers. The wealth of its merchants and of the Trinity Guild and royal patrons was directed towards magnificent building projects. The international trading links of Coventry’s merchants and the international links of Coventry’s religious houses introduced European influences that were not commonly seen elsewhere. Much of this legacy has been overlooked with a more recent focus on the Blitz and post-war rebuilding history. But recent research, and renewed interest in the city’s forgotten medieval past, is uncovering the full glory of Coventry’s medieval treasures once more. This is the surviving section of a massive crucifixion scene that would have covered the whole of the south wall of the refectory. It is the only surviving monumental wall painting from an English Carthusian monastery. Painted some time in the period c.1420 to 1437 in the International style, it is of exceptional quality and one of the most important medieval wall paintings in England. Painted over the entire east wall of the nave in the 1430s in the International Gothic style, the Doom painting is the most valuable in the country. Whitewashed over in the mid-16th century, it was rediscovered in 1831, re-touched and coated in a varnish that darkened the image over the years. It was rediscovered a second time in the 1980s, subjected to scientific analysis and restored. The sophistication of the composition, the expensive paints used and the technique of the local artists is now apparent. 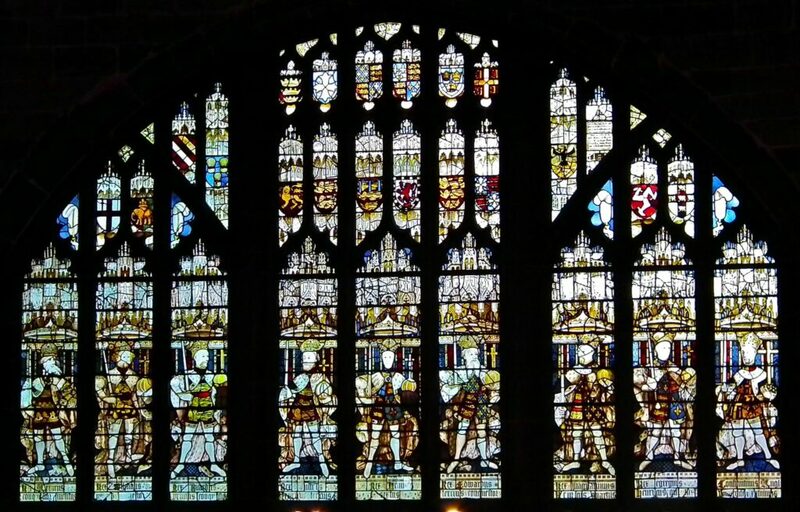 John Thornton of Coventry is best known for his work on the internationally famous Great East Window of York Minister, 1405–8. New research has shown that he operated a glazing business from Coventry which undertook commissions across England. It is likely that much of his work was also showcased in Coventry, particularly in the newly enlarged parish church of St Michael. Much of the surviving glass was taken away for safekeeping during the war and has recently been restored. This depiction of the ‘Five Wounds of Christ’ is from the Clerestory windows at St Michaels and can now be seen in the ‘new’ cathedral. Other fragments are said to depict the faces of ordinary Coventrians in the early 15th century. The tapestry on the north wall of St Mary’s Guildhall was designed for the wall and has remained there since it was woven in c. 1500. This alone is unique. But what makes the tapestry of national importance is its sophisticated composition, iconography and message. Stylistically, we can suggest it was made in the Southern Netherlands. The patron may have been the Trinity Guild or even the king. The piece is arranged in six sections, with a clear message of hierarchy and authority. In the upper sections is the heavenly court including a series of male and female saints, nearly all martyrs of the early Christian church. 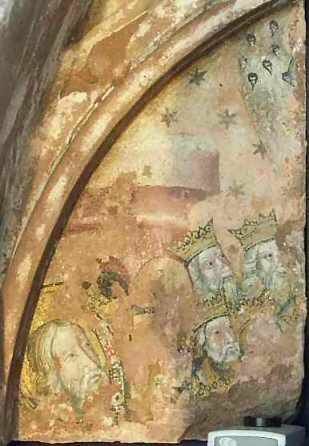 Authority is passed to the king and queen in the central section below, who are depicted with their courtiers. In the vertical section is the assumption of the blessed Virgin Mary, surrounded by the 12 apostles. The upper central section is a later addition of Justice, but originally was almost certainly a depiction of God. Below the tapestry, on the raised dias, the mayor and his brethren would have sat. The tapestry aligns perfectly with the stained glass window above. Together, they are a powerful symbol of Lancastrian royal power, and perhaps refer to Coventry’s golden period in the 1450s. In 1451 the city was made a county, and during 1456–9 Henry VI and Margaret of Anjou relocated to Coventry and Kenilworth Castle, so for three years Coventry was effectively the city the capital of England. 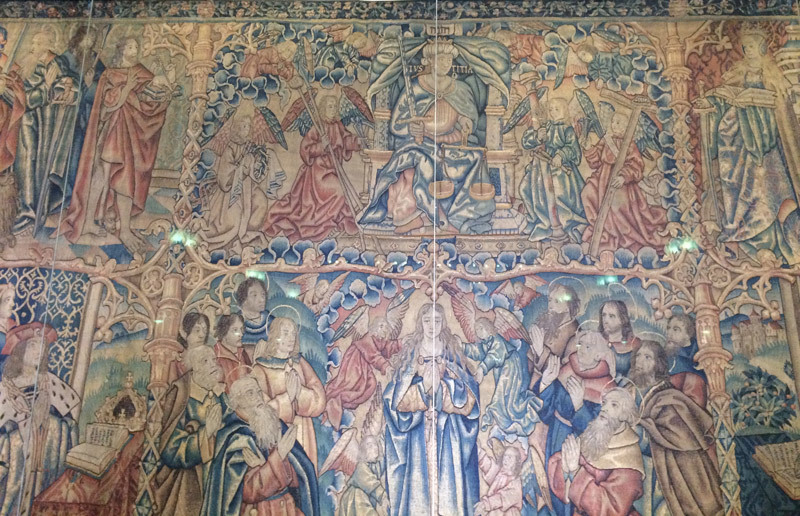 Woven during the reign of Henry VII, the tapestry would have been met with the king’s approval at a time when he was petitioning the Pope for the canonisation of his uncle, ‘saint’ Henry VI, who was murdered in 1471 and around whose tomb miracles were said to have occurred. The north window was built in c. 1420 and retains about half of its medieval glass. It celebrates the achievements of the House of Lancaster with Henry VI as the central figure and his father Henry V and grandfather Henry IV nearby. The conquering kings Arthur, William I, Richard I and Edward III are all depicted, together with the Emperor Constantine and Henry III. The glazing has been variously dated from c. 1420 to c. 1485, but a mid-15th century date is most likely. The window and tapestry together are unique pieces of 15th century Lancastrian propaganda. In 2000, excavations at the cathedral priory of St Mary uncovered fragments of the richly painted wall of the Chapter House. 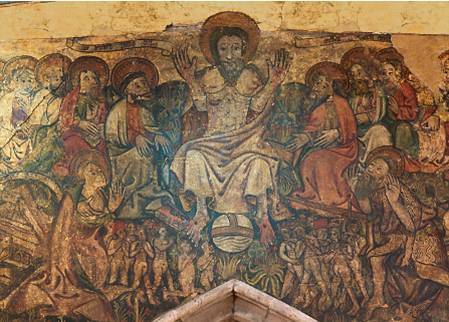 The largest piece – the scene of the Apocalypse, exquisitely painted within the arches of the arcade of the monks’ sedilia around the lower walls – is now housed at the Priory Visitor Centre. Experts believe the panels were painted in c. 1360–70 and represents English work influenced by earlier Renaissance models. It is of higher quality than the mural at the Chapter House at Westminster Abbey. Parliament was held in Coventry in 1404 and 1459 and sat at the Chapter House. 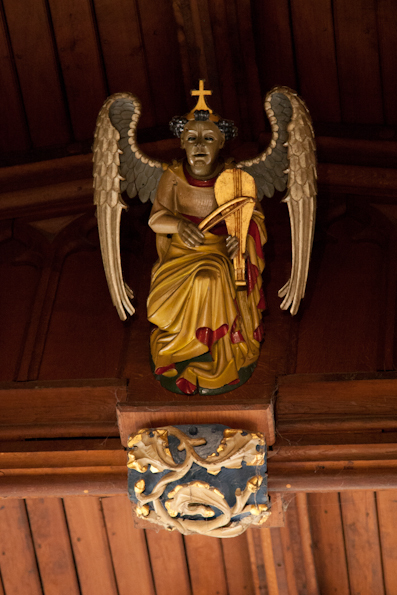 The late 14th-century roof carvings show ten angel musicians, and at the intersections of the moulded ribs are heraldic bosses, 15 to each compartment. The bosses including the white hart of Richard II, who frequently visited Coventry. He was a member of the Trinity Guild when it was formed in 1392 by the amalgamation of four earlier guilds. Other bosses include a swan, pelican, griffin, unicorn, elephant and castle, green man, horse, crowned lion and a jester. The bosses demonstrate the fine workmanship of Coventry’s woodcarvers. This can be seen elsewhere in the city, from the guild chair of c. 1450 in St Mary’s Hall to the St George and the Dragon wood sculpture from St George’s chapel, now at the Herbert Art Gallery and Museum. Fine wood carving can also be seen on some of the surviving vernacular buildings of Coventry, including in Bayley Lane, Ford’s Hospital and Spon Street. The Coventry ‘mystery plays’ are as famous as their equivalents in York and Chester, but Coventry has the only surviving 15th-century version of one of the plays – the weavers’ playbook. The book is now stored in the archives of the Coventry Records Office. It is a lucky survivor – playbooks were used during the actual performance and later thrown away when they wore out. The plays were usually performed on long vehicles and wheeled around the city, stopping at particular stages, as in 1457 for Margaret of Anjou. 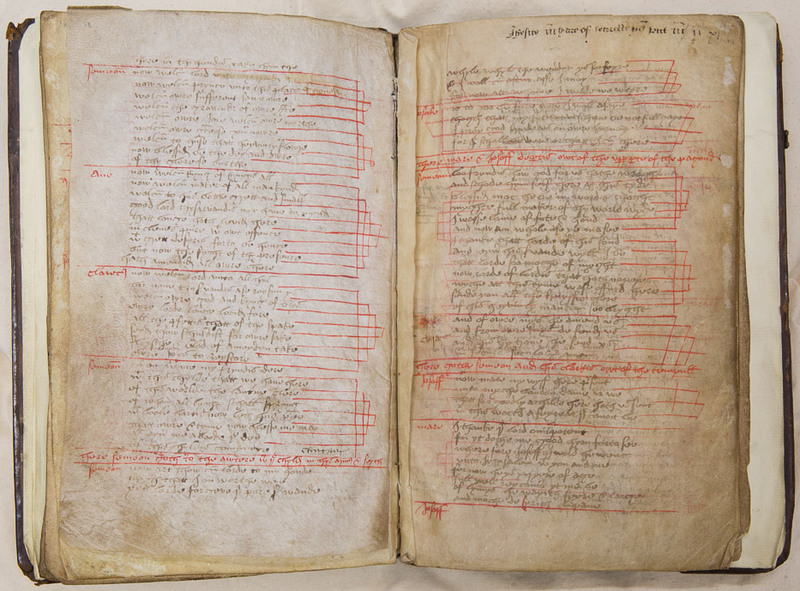 The ‘Coventry Carol’ is said to be a musical survivor of the 15th-century mystery plays. The important ‘Caput Mass’ survives as a document in the Coventry Record Office as an example of the highest quality of music performed in Coventry in the 15th century. This is a unique survivor of the period and is of international significance. A group of choristers at the collegiate chapel of Bablake (now St John the Baptist) were extremely skilled at polyphonic choral music, of which the caput is only a fragment. When Henry VI and Margaret of Anjou attended Mass at the newly enlarged St Michael’s church on 29 September 1451, the Caput may have been sung for them in a service led by the Bishop of Winchester. Bare-headed, the king walked around the church, and the scene may be depicted in St Mary’s tapestry. Coventry had a strong music tradition in the 15th century, including performances at royal entrances to the city and elaborate processionals. To view an extract of the Caput Mass being performed at St Mary’s Guildhall, Coventry, please click here.